Because the Catechism of the Catholic Church conveys the essential and fundamental content of Catholic faith and morals, it is important to start with that text in study of the Catholic faith. This essential resource is available in apps which you can access using your digital mobile device. Within these two apps, Catechism text is available as a web view display as it is published on the Vatican web site. Internet connection required. Due to copyright issues, generally, the only way you can view the Catechism using a mobile app is if it is embedded from the Vatican source as it is in these apps. Kindle via Amazon ($9.95) offers an e-book version, but the online text is difficult to read on a smartphone; Free on-line version here. The US Conference of Catholic Bishops offers the Catechism in e-book format Catechism as a downloadable electronic book ($9.99) iOS and Mac to be read on Apple’s iBook format. searchable version–You can search by a search string or phrase, by paragraph numbers or a virtual thumb through the book. Other minor catechisms available on iPieta are Baltimore Catechisms #1, #2, & #3; Catechism of Christian Doctrine, the Roman Catechism and Catechism of St. Thomas Aquinas. For an investment less than the price of the printed, hard-bound book ($10.99), you can get an app containing the complete text of the Catechism of the Catholic Church to download on your device or save in the cloud for your access. First you must download the free Verbum Catholic Bible study app. This is the best Catholic Bible study app in the market. While it is a free download, the Catechism text is extra ($10.99). That is because the Catechism app is technically not a stand-alone app. You must download the Verbum app, then purchase the Catechism from Logos online and the Catechism book will show up in your “library” in Verbum. Want both English and Latin versions of the Catechism of the Catholic Church? You can download both volumes for $24.95 for use with the Verbum app. Why wouldn’t you want to just get a free version that you can read on your device? First of all, this comes in a readable format suitable for mobile devices. It can be read off-line. Perhaps more importantly, this exceptional Catholic Bible study app includes highlighting, bookmarking and note taking capabilities which it saves on line so you can access your information and open to the last page read among your mobile devices or your computer. Plus, you get a free Catholic bible (Douay-Rheims), daily devotional based on the saint of the day, and the complete Roman lectionary (English). A video tutorial is bundled with the app to help you learn how to use many of its features. St. Clement ePress develops some of the more beautiful Catholic apps on the market and this one is no exception. The complete text of the Catechism of the United States is served up in tab sections corresponding to divisions within the printed book. This text is not downloadable, but viewed with internet connection to the Vatican web site which owns the rights to this text (a bit difficult to read on a smart phone but fine on a tablet). So why shell out three dollars for the app when you can access the same content on line? Because the book experience is segmented properly and packaged beautifully, it offers the ability for you to bookmark and, best of all, it comes with a terrific Quiz game wherein you can test your knowledge on the more salient points of the various sections. The Quiz is a well-thought-out set of questions designed to engage the reader in basic catechetical points. Your device vibrates when you select an incorrect answer! Use this to reinforce your personal study or as a fun activity with your family, just as you would with any quiz app. The United States Catholic Catechism for Adults is an excellent resource for preparation of catechumens in the Rite of Christian Initiation of Adults and for ongoing catechesis of adults, according to the United States Conference of Catholic Bishops which produced the text. This valuable resource in English and Spanish is available in digital format in an online version (free), e-book version ($9.95), audio version-CDs- ($59.95). Hard-bound book versions in English and Spanish are $24.95. The USCCB Committee on Evangelization and Catechesis which released the online resource notes that it is based on the Catechism of the Catholic Church, following its outline. “The USCCA walks the reader through the Creed, the sacraments, moral life in Christ and the prayers of the Church,” the evangelization committee explained. Each chapter begins with a story about an American saint, blessed, or holy man or woman and how she/he lived a life of faith as an American. The USCCA online version is searchable, printable, and shareable. The table of contents provides easy access to each chapter, and the glossary is included as well as the appendices. On-demand faith formation resources like you’ve never seen before. Billed as “the Netflix of Catholic media content,” Formed is an exceptional Catholic faith formation tool bundling into one platform trusted and popular Catholic videos, audio talks, eBooks and movies all at your fingertips on-demand. Imagine having available on your smart phone, tablet, laptop or computer entire video education series produced by trusted and respected catechetical resource powerhouses such as Word on Fire, Symbolon, and Lighthouse Catholic Media. Topics cover adult faith formation, marriage, sacramental formation, Scripture, formation for teens and personal devotion. Check this out… You get more than 300 episodes of video education series including Bishop Robert Barron’s entire CATHOLICISM series (with parish subscription) But that’s not all. You also get to watch 12 full feature faith-based films; read 20 Catholic eBooks from top Catholic publishers; listen to more than 30 hours of lectures from your favorite Catholic speakers on a host of topics involving your Catholic faith. The Augustine Institute partnered with Lighthouse Catholic Media, Ignatius Press, St. Paul Center for Biblical Theology, Word on Fire and Marian Fathers of the Immaculate Conception to bring you this wealth of resources on demand. The CATHOLICISM series alone costs $100 for the complete DVD set. But through FORMED, you get it (and everything else) for free if your parish subscribes. For $9.99/month you may take out a personal subscription which includes everything the parish has access to minus the CATHOLICISM series and study guides. But before you take out a subscription, ask your parish if it already subscribes to FORMED. If it does, the parish will supply you with an access code to open up FORMED on line for free. It formats well to all the many digital mobile platforms out there. New content is added periodically. Available in English with several programs available in Spanish. Internet access is needed as no content is downloaded to your device. Word on Fire (Free) Catholic evangelization. This is no longer a free-standing app. If you have this already on your Apple device (it was only in iOS format) your app icon will automatically open in WOF’s mobile web version. It is presumed that by dumping the app and going for a web presence that automatically formats to smart phones, tablets and monitors, users with any type of format could access the content readily and easily on their device when connected to the internet. Simply bookmark the WOF web site in your mobile browser. Word on Fire Ministries owns this genre of engaging instruction and commentary about our Catholic faith. Spawned from the popular web site of the same name, Word on Fire offers daily blogs, articles, commentaries and over a decade of weekly sermon podcasts by the ministry’s founder, Bishop Robert Barron–the creator and host of the groundbreaking, global ten-part documentary series, CATHOLICISM , which breathed new life into the understanding of our faith on a global scale via broadcast television and digital media. Enjoy solid teaching in a relaxed, non-threatening style that is easy to understand; his instruction is approachable and engaging. Think of it this way: the spirit of Venerable Archbishop Fulton Sheen has been recast in our age with Bishop Barron (minus the jokes and frivolity). You will enjoy Bishop Barron’s timely commentary on relevant issues touching us today and his up-to-date posts answering so many questions that begin with the word, “Why.” We wish you could park an app icon on your mobile device, but for now just bookmark the web site and you will be pleased with the robust interface. You can also subscribe via RSS feed to Bishop Barron’s blog, articles and YouTube videos. To subscribe, you will need a RSS reader, such as Feedly. Simply sign up for Feedly and then click the subscription button of your choice on the Word on Fire subscription page. If an app can induce a backflip, this would be it–at least for me. Here is your opportunity to browse hundreds of hours of audio and video lectures live and on-demand on a whole host of topics related to the Catholic faith. This serendipitous find is brought to you as a gift of the New Evangelization by the Institute of Catholic Culture, an adult catechetical organization that offers education programs structured upon the classical liberal arts. This is serious content delivered to you by competent and faithful lecturers in their fields; but it is not erudite or elitist. It is down to earth and rock solid Catholic on topics such as Scripture, Church History, Philosophy, Politics, Theology, Ethics, Ancient/Biblical World and much more. Popular lecturers include Msgr. Charles Pope, Alice von Hildebrand, Fr. George Rutler, Dale Ahlquist, Deacon Keith Fournier, William Marshner, Bishop Robert Morlino, Timothy O’Donnell, Fr. Paul Scalia, Bishop Clarence Silva, Bishop Robert Vasa and more. What is missing from that list is women. Surely, beyond Dr. von Hildebrand, women scholars could be found to enlighten us on a variety of topics. In this day and age, that can be considered a serious flaw in catechetical presentation. Many lectures come with lecture hand-outs on pdf files you can print out. You can also subscribe to podcasts of lectures through iTunes. The live broadcast feature works effortlessly. Check out the ICC web site for a complete list of their rich offerings and explanation of this spectacular on-line educational ministry. Language: English only. Need internet connection to access content. The Fellowship of Catholic University Students offers its resources for Bible study, faith formation and evangelization in a convenient app designed to appeal to young adults. You get audio talks by leading Catholic evangelizers; complete Bible study sessions with topics and questions; How-to series on evangelization, disicpleship, and leading a Bible study; videos and full-length audio talks from FOCUS conferences and much more. FOCUS has been on a spirit-filled mission to enhance faith formation with Catholic college students for a number of years. This app showcases a sampling of their considerable educational resources. While it is ideal for young adults, it is offers great material for folks of all ages looking to amp up their knowledge base and spiritual/faith formation. Designed as an interactive way for you to participate in the Year of Faith, this app offers daily challenges for you. Could be a prayer to say, a song to listen to, a sermon to hear. It is accompanied each day with a little lesson about the Catholic faith. From Developer: “Visit each day during this Year of Faith for a new post to help you learn your Catholic faith, love it more deeply and live it with passion! Download the mobile app for an interactive Year of Faith calendar, complete with daily challenges, suggested reading, and the ability to set reminders and sync with your other mobile calendars.” Customizable with ability for you to add your own calendar of events along with event reminders. This app is designed to connect you to a local parish using a geo-locator map that shows all the Catholic churches in your area. Explore your Catholic faith in some of the content offered and, of course, stop in to the brick-and-mortar building for a visit, especially during Mass times. The app insists that you choose a parish before your proceed any further. Once you are connected to a parish, it’s YOURS (unless you wish to change it, which is easy to do). In your parish’s portal, you have all the information you need to start engagement–most notably a Mass schedule, contact information and a link to the parish web site. Because this app is relatively new, not all parishes are up and running with other elements on the app like a parish directory and pastor’s message. Do double-check with the parish web site for accurate schedules as many parishes do not keep updated with the national program (Mass Times) which collects their data. Perhaps you already are engaged with your local parish but are looking for something to help deepen your faith life or get more involved with the parish community. That’s where the educational elements of One Parish come in to help. Hit the “Daily Faith” tab and you’ll get Mass Readings and Saint of the Day information. Enjoy listening to or watching video of enriching homilies and reflections from the popular Word on Fire ministries. Perhaps the pastor at your parish posted a reflection–he can do that through this app if his parish is connected. And you can listen to Catholic Talk Radio programming and read Twitter messages from Pope Francis (even if you don’t have a Twitter account). While there are other apps out there with more faith content, this one gathers components of actual parish life with an actual faith community that is meaningful to you. If your parish is affiliated with One Parish app, you will see detailed content on the families involved in that church, the parish’s calendar of events, a means of making your donation through the app’s donation portal and much more. The Mass Explained (Vol. 1) ($24.99) second-generation iPad 2 or newer ONLY. It will not work on an original iPad. This glorious educational app is in a class by itself, and as its price suggests, you get what you pay for and much more. We should all have a richer, more profound understanding of the Mass which is our quintessential point of contact with God. Catechists, school children, seminarians, young adults, bored adults, fidgety adults, non-Catholics, those on a quest for more mystery in their life and Catholics who think they know it all. Well, imagine a book jam-packed with multi-media resources that takes you on a journey in, through and around the subject of the Mass–its origins, history, nuances, principle gestures, principle parts, sacramentals, music, art, Scripture, the language of Jesus and so much more. This app does what all apps should do with the lofty subject of our Catholic faith–push the extreme limits of digital craftsmanship that the reader deserves. THIS is digital evangelization at its very best, and we are indebted to its programer and developer, Dan Gonzalez, for showing everyone in the app world how to make a serious product worthy of the glory of our faith and the dignity of the inquiring soul who touches the glass screen. It is only available on a 2nd generation iPad for a reason. As its developer notes, The Mass Explained takes full advantage of what the Mac can do with hands-on learning that makes the Mass come alive. Explore the significant aspects of historical development with panorama pictures that immerse you into the scene, interactive maps, slide shows, videos with 3-D animations and audio that enables you to listen to prayers and chants in their original languages. Of course, this app comes loaded with foundational documents and works of serious scholarship surrounding the subject. You will never view the Mass the same after sifting through the vast resources at your fingertips. This app alone should entice you to upgrade to a new iPad if you don’t have one already. It’s THAT glorious. Still not convinced? PLEASE check out The Mass Explained for a video overview and an impressive list of linked reviews which give highest marks for this exceptional product. This first volume of the Mass Explained app explores the first two parts of the Mass, Introductory Rites and Liturgy of the Word. Developers note that a second volume will be produced to cover the last two sections of the Mass, Liturgy of the Eucharist and Concluding Rites. Available in English only. – English, Spanish, French, Polish and even Latin! Catholic trivia game that also is available as a board game that you can download and print. 500 questions–multiple choice–with references for answers from Canon Law, Scripture, history, the Catechism of the Catholic Church and other sources. Get a correct answer and the pope applauds. Get an incorrect answer and a nun smacking a ruler appears. A little too cliche, but the questions are fair and on a wide variety of subjects. This game helps brush up your knowledge of many of the finer points of our Catholic faith as well as basic elements. This is a good game to pull out instead of wasting your time on Candy Crush or Angry Birds. Great for long car rides with children. With your family: the winner of the game gets to opt out of doing dishes! Here’s your chance to test your knowledge of the Catholic faith like a champ. As we expect in a well-designed digital game, it requires you to work your way into increasingly difficult levels in order to advance through the game. How did this gutsy app come about? Identifying a void in intellectually challenging Catholic trivia apps and Catholic apps for Android in general, five Australian Dominicans set out to create a high-octane game. We’re talking five levels, 1250 questions covering six categories – Art and Literature, Biblical knowledge, History, Liturgy and Customs, Saints and Personalities, and Theology. In short, the app respects your intelligence. Read more about the development of Catholic Trivia app here. 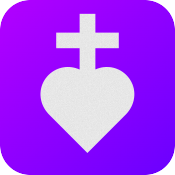 iOS (Free) Okay- your mobile device is not truly Catholicized without the Pope. So, here you go. All the papal encyclicals for the last 50 years! Lots of Church documents including the documents of Vatican II. Many prayers categorized for ease of selection. This was last updated in 2010, so the content is not up to date with anything from Pope Francis, for instance. But the material offered is substantial, nonetheless, and at the right price. Catholic Quiz ($2.99) iOS- This is a trivia game for all things Catholic. Interesting concept. There are rewards based on correct responses. 0000h! Just like Catholic school! This is the official app of the Archdiocese of Cincinnati and focuses on “Discovering the Faith”, “Living our Faith”, “Expressing our Faith”, and “Local Archdiocesan News.” You get Catholic faith blog, video live stream of Mass, audio homilies in English and Spanish. Much of the content is unique to the Cincinnati area, but you may enjoy receiving the other content. Impressive product from an archdiocese, and we offer it as a healthy example of what our dioceses can offer as part of the New Evangelization. Don’t let the low-tech icon fool you into thinking this is a cheesy app. Produced by the Ethics and Public Policy Center in Washington, DC, this app offers rich content for users to explore Catholic social teaching, a central and essential element of our faith. This app neatly segments study of the topic into four parts: commentary, Church documents, authors and cross-reference search. You’ll likely head straight to the commentary segment which is filled with links to published articles on topics relevant to today’s social justice issues. Kudos to the app developers for providing links to the original source of the articles with brief summaries. Further kudos for choosing an impressive list of Catholic authors representing a broad spectrum of thought including popes, bishops, theologians, canon lawyers, scholars, pundits and, of course, a Jesuit or two. But do not expect to find commentary leaning wildly left as most articles are gleaned from publications with a decidedly conservative bent. Principle ecclesial documents key to understanding social teaching in light of the Catholic faith are all included from Rerum Novarum (1891) to Evangeli Gaudium (2013). These are the primary, indispensable sources articulating our modern faith tradition in this arena. The built-in search cross-references commentaries and Church documents, but the search terms do not typically bear much fruit. 8 languages: English, German, Polish, Spanish, Japanese, Korean, Simplified Chinese, Traditional Chinese. From developers: A school of prayer and discernment for the New Evangelization! The best authors, teachers, spiritual leaders discussing topics that effect our every day lives. Shows range from Inside the Pages w/Kris McGregor to series with Fr. Timothy Gallagher, Deacon James Keating, Dr. Anthony Lilles, Dr. R. R. Reno, Mike Aquilina, Joseph Pearce, Msgr. John Esseff, Archbishop George J. Lucas and many others. From lives of the saints to the basics of Catholic Social teaching, from the Sacred Liturgy to prayer in the everyday moments of our lives, we walk together as we fulfill our call to be saints in the making. Audio apps featured below are all from Catholic MP3 Vault which offers streaming audio of Catholic lectures and readings. Simply download the app in the selected category of interest and (with internet connection) start listening. You cannot download the recordings unless you order them directly from Amazon. These apps come in a FREE version with a few recordings offered. You can upgrade to the paid version ($8.99) to open the entire set of audio recordings for that app. Be enamored with the rich variety of thought and inspiration by competent lecturers whose vintage recordings have been captured for our listening pleasure on line. Hours and hours of recordings! If you are looking for good, solid, faithful instruction, these apps contain some timeless gems. Listen while driving, gardening, cooking, lounging–so enjoyable to listen to these offerings. Edifying and inspiring. http://www.discerninghearts.com has a great app for people who want to grow in their spirituality.